At Amitrace we’re dedicated to helping our clients get the best possible video solutions. However one of the hardest things that a lot of people face is just the act of starting out. It can be scary for a lot of reasons, whether it be because you’re inexperienced and don’t really know what to look for or maybe you’re afraid of how much money you might need to spend and you want to spend it on the right things. We’re here to alleviate that fear! Today we’ll be talking briefly about a very basic solution that Amitrace offers to help you get on your feet and start broadcasting. For starters, the thing that every broadcast solution needs is some way to control the entire show. This is commonly referred to as a video switcher, a device that is responsible for controlling your inputs and outputs and what ends up going on the air. Video switchers come in lots of different flavors, but today we’ll be looking at NewTek’s TriCaster Mini. The NewTek Mini HD-4 starts at $6k. The Mini is what’s referred to as a “Turn Key Solution”. In the same way that you would put the keys into your car and expect everything to work despite being made up of a thousand different parts, the TriCaster Mini has multiple functions all in one package. The Mini is capable of streaming, broadcasting, and recording, even simultaneously. It’s also how you control your graphics that are appearing on screen for your show and how you control which camera is broadcasting to your audience. If you wanted to go from the news desk to the Weather Wall, you could do so from the Mini. Of course the only way that you’re going to be getting any sort of video or audio into your show is with cameras and microphones! This is obviously the part of your setup that most people are already familiar with. There’s lots of different types of cameras available out there. Ultimately what you end up using is a personal decision on what you’re trying to do with your show. Cameras can be used with teleprompters to give your on screen talent a script to read. Moving on, your production is going to need some sort of set. This is trickier than people may realize because we’re so accustomed to seeing professional made news sets for television. While we don’t give them much thought, those sets are very carefully tailored and crafted to give a powerful appearance yet not be distracting and overbearing. Not everyone can spend that kind of money on interior design, so this solution has an alternative with a green screen. Using the green screen you can place graphics and environments with your on screen talent so that you don’t have to create an enormous studio. Of course you have to be careful with what you use for your green screen so that you don’t end up with anything looking cheap and fake. Part of the reason we include the TriCaster with this particular solution is due to its capabilities with the green screen. 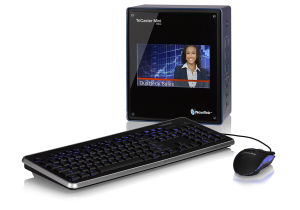 The TriCaster comes with several pre-made “Virtual Sets”. Virtual sets are virtual environments that, when used with a green screen, can put your on screen talent into a professional looking environment without having to redesign the entire room. It’s a great feature that has a lot potential and choices with how you use it. TriCasters come with virtual sets which can spruce up your production with minimal redecorating. Once you have all this equipment you just need a crew to run it and you’re all set! You’re now ready to run a great broadcast! Another great about all of this is that Amitrace offers all of the equipment that we just talked about! We offer a basic, starter bundle starting as low as 10k which includes everything mentioned. If you already have equipment to start with we can customize a bundle tailed specifically to your needs and help you save money. Lassiter High School with their brand new news desk as part of their video solution by Amitrace. Feel free to give us a call for your free consultation or demo today. Everyone’s gotta start somewhere, so let us help you start today.